To get the full version registration key for your personal computer, please send us the Red Aleatory Number in the "Register" section of the program, installed on your computer. 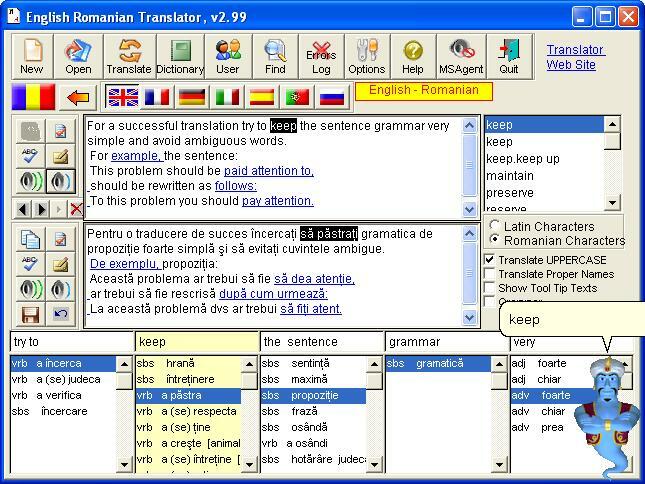 This program uses the MSAgent characters already installed on your computer, to speak both English and Romanian texts. If the speech part doesn't work, you need to download and run the following self-extracting archives msagent.exe, spchapi.exe, lhttsiti.exe and agtx0418.exe from http://microsoft.com/msagent. Try now the free online English Romanian Translator! Download English Romanian Translator -trial version- and install it on your computer! Enter your text here and then click on Translate button! Click here to add it to your site!